X-ray light released by an erupting black hole (dot at center) echoed off dust to form concentric rings around the binary system, V404 Cygni, which lies about 8,000 light-years from Earth. Rings of X-ray light flare and fade around an active black hole in a stunning new set of observations by NASA's Swift space telescope. The bull's-eye structure around the erupting black hole results from the jostling and reflection of X-ray light by dust, which creates a series of "echoes" that are visible in this video. The black hole orbits in tandem with a sunlike star at the heart of the system V404 Cygni, which lies about 8,000 light-years from Earth. Swift spotted an outburst of activity from the black hole on June 15, and the spacecraft's X-ray Telescope detected the expanding rings during observations made in late June and early July, NASA officials said. The black hole is easy to see in the new images without the rings pointing the way; it appears as a bluish-white dot. But the bull's-eye really marks the spot of the invisible interstellar dust between Earth and the system. The various layers of dust, which are found between 4,000 and 7,000 light-years from Earth, reflect some of the X-rays over toward us as they fan out in all directions from the black hole. 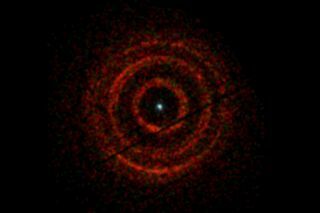 The Swift X-ray image of V404 Cygni creates a circle in the sky about half the diameter of the moon as seen from Earth. This image shows the rings as they appeared on June 30. "The flexible planning of Swift observations has given us the best dust-scattered X-ray ring images ever seen," Andrew Beardmore, an astronomer at the University of Leicester in England and leader of the investigating team, said in a statement. "With these observations, we can make a detailed study of the normally invisible interstellar dust in the direction of the black hole." V404 Cygni's arousal on June 15 was likely caused by material falling into the black hole, part of a cycle that repeats every few decades, researchers said. The companion star is about 10 percent as massive as the black hole, and the behemoth pulls a stream of gas away from it over time. The cool gas can resist the black hole's pull, but when enough gas builds up and heats up, it's suddenly pulled into the center of the black hole, triggering a sudden outburst of X-rays. Astronomers caught its most recent eruption before this one in 1989. The outburst offers a rare opportunity to gather data about the nearby binary system, the black hole within it and the normally undetectable interstellar dust clouds that stand in its way, NASA officials said.